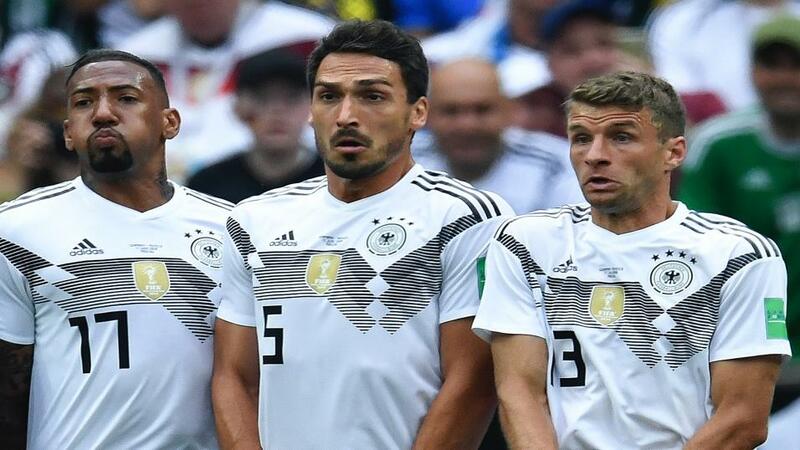 After their World Cup blowout and Jogi Löw's public dumping of Mats Hummels, Thomas Müller and Jérôme Boateng, Germany have a big week ahead, writes Andy Brassell. "That the coach wants to move on is fair enough, and for all their sterling service Hummels and Boateng in particular don’t present an overwhelming case for retention. Such a sweeping gesture, though, is fraught with risk." At this point in the season, most European coaches and fans alike feel the same about international football - that it's an unwelcome distraction, interrupting the real business of the culmination of club seasons all across the continent. With domestic title races poised and both the Champions League and Europa League reaching the last eight, it's not hard to understand the sense of intrusion that some have. Such is the routine of feeling this at this time of year that it's easy to overlook how international football has changed in Europe. The Nations League was an overwhelming positive reshuffle of the international calendar, particularly for supporters sick to the back teeth of half-paced friendlies. It continued the positive mood created by a thoroughly enjoyable 2018 World Cup. Having said that, the tournament in Russia wasn't a great experience for everyone. Germany, who became the fourth holders in five tournaments to fail in their defence of the trophy in the group stage, are still struggling to deal with the fallout from not just what went wrong, but the manner in which it went wrong. This week, then, represents a new start for Joachim Löw and company as the new, streamlined qualifiers for Euro 2020 get underway. After playing Serbia in a friendly in Wolfsburg on Wednesday - Germany are big favourites at [1.41], with the draw at [4.7] - the real business begins on Sunday night when Germany travel to face the Netherlands in the first match of their Euro 2020 campaign. The venue and the opposition are significant. Germany's last trip to Amsterdam was just five months ago, and they were humiliated 3-0 on their way to relegation from their inaugural Nations League participation. It was a fitting end to an awful year for Löw's team, in which they lost an unprecedented six of their 13 matches. After a decent opening to the Nations League, in a goalless yet entertaining draw with France, the defeat to the Dutch was confirmation that cracks were simply being papered over. Given that, it's not hard to understand why Löw felt drastic action was needed to begin to turn things around - and, perhaps, to save his job. Two weeks ago, the coach and DfB general manager Oliver Bierhoff made a visit to Bayern Munich's training centre to tell veterans Mats Hummels, Jérôme Boateng and Thomas Müller that they would no longer be considered for selection. That the coach wants to move on is fair enough, and for all their sterling service Hummels and Boateng in particular don't present an overwhelming case for retention. Such a sweeping gesture, though, is fraught with risk, and it's difficult to argue that the trio deserved what amounted to a public sacking after their roles in past successes, and in particular the 2014 World Cup triumph. In his desperation to put distance between himself and the failures of 2018, Löw has created a situation - angering Bayern, the country's preeminent club, putting pressure on new picks like Lukas Klostermann and Niklas Stark, plus leaving the Bayern three as shadows in the background. If he should have to call them back having publicly closed the door on them, it will be beyond embarrassment. The early betting on a Euro 2020 winner has Germany as fourth favourites at [8.4] - joint with England - which tells us that the market feels there is a considerable way back to be made for Löw and company. Finishing in the group's top two should be straightforward, but the manner matters right now. A result in Amsterdam would go a way to beginning that process, but another defeat would cast doubt over whether Löw is the right man to lead the rebuild.